All autoroutes towards Amsterdam reach the Amsterdam ring (A10). We are located at the South-East of Amsterdam (Watergraafsmeer/Science Park). Coming from the direction Amersfoort follow Utrecht/Den Haag. From the direction Utrecht/Den Haag/Schiphol/Haarlem or Zaandam follow Amersfoort. On the ring take exit ‘Watergraafsmeer/S113′ (ring Oost). At the end of the exit follow the signs to ‘Science Park’. Please note the parking in the compulsory parkingspace P3, is charged according to Amsterdam parking policy, corresponding to ~ € 25,- a day. 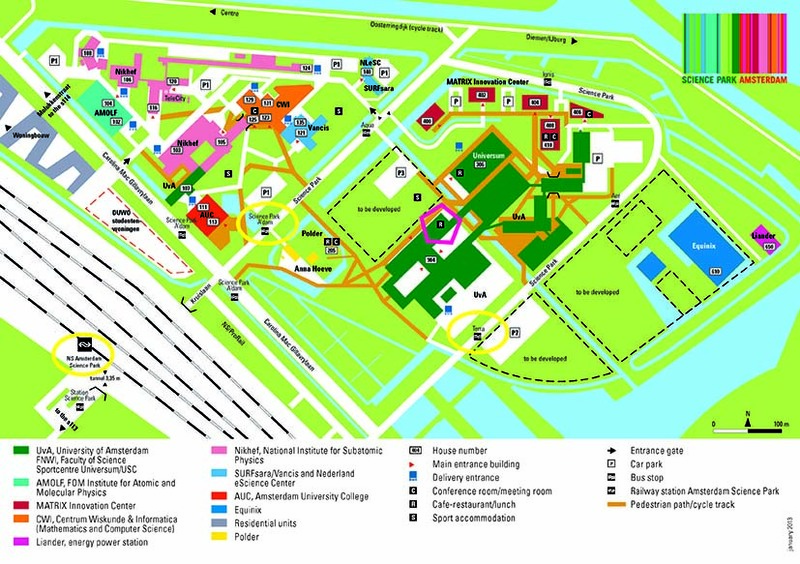 An NS train station “Amsterdam Science Park” (yellow) is located at just 400 meters distance from the Science Park building. Schedule your trip with the Dutch train-system www.ns.nl. As an alternative on can take from Amsterdam Central station the metro (or train) to Amsterdam Amstel station. From here bus 40 will bring you to the University grounds at Science Park, having stops (yellow) at 100 meters distance from the Science Park building. Schedule your trip by public transport at http://9292.nl.